Last week we left Cadillac struggling with various opponents to his dream of monopolizing the fur trade at de troit. Fathers Carheil and Marest were doing their best to keep their First Nation charges at Michillimakinac. The Jesuits had also established a mission at the St. Joseph to destroy de troit, or so he thought. Now even more problems appear. Governor de Callieres died and his replacement was Philippe de Rigault, Marquis de Vaudreuil. He was visited in Montreal by a delegation of Ottawa representing about 80 people left at Michilimakinac. They told him that they wished to die in their villages and refused to move to de troit. Vaudreuil had also received word that the Miami and Wyandotte that had moved to de troit had met in council with the Seneca Iroquois about safe passage through their territory. They wished to explore trade with the British at Albany. Quarante Sols, the Wyandotte chief of de troit confirmed this and Vaudreuil forbade it. The Company of the Colony was also complaining loudly about the cost of establishing the new post. All this led de Vaudreuil to send a report to France. Count Ponchartrain, Minister in charge of the Colony, was informed that he and Indendant Beauharnois had decided to send Father Marest back to his mission because the Ottawa and Wyandotte there refused to move. He also stated that if trade between their First Nation allies and the British was ever established it would be because of de troit. It was burdensome to the Colony as well because of the exorbitant costs of enticing the First Nations to give up their villages and move to lands around Fort Ponchartrain. He advised that de troit be abandoned. Cadillac fought back. He appealed in a letter directly to the King. The job of getting all the nations around to move to de troit was all but complete. He reported that there had been to date 2,000 First Nations people living around the new fort. They had 400 men under arms, ample protection from attack by the Iroquois. These 2,000 souls included a village of mixed Saulteux and Mississauga Ojibwa, all the Wyandotte except 30 who remained a Michillimakinac, a Miami village of about 30 families, and all the Ottawa except the 80 that remained at Michillimakinac. There were also some Nipissing that joined the Ottawa and a village of Delaware Loup. Trade was being done and at no cost to France’s treasury. Cadillac also informed the King of the bickering that was going on in the far country of the Colony. The Sioux had attacked and killed some Miami and it had escalated to a war between the Sioux and eight of France’s First Nation allies. Cadillac took credit for brokering a peace but implored the King to augment the new fort with French regulars and settlers, not abandoned it. He said the reason the peace was so hard to keep was because of the lack of a French presence in the far country. Cadillac won out. The newly established Fort Ponchartrain would not only survive but would be expanded. Cadillac was an imposing presence, well liked by the First Nations and could manage the affairs of the new post quite well. However, the one area he had problems with was trade. The Miami and the Wyandotte did secure safe passage to Albany. So did the Saulteux and Mississauga Ojibwa. At the same time the Great Peace Treaty was being negociated in Montreal a number of Ojibwa chiefs travelled to Albany with some French fur traders to explore the idea of trade with the British. Towasquaye a Wyandotte trader visited Albany a couple of years later and found he was treated well. He returned with a delegation sent by the chiefs of de troit to visit the governor Lord Cornbury. Tehonwahonkarachqua, a Miami and son-in-law of Michipichy the principle Wyandotte sachem and Rughkiwahaddi a Wyandotte spoke for their chiefs. They found not only were they well received but the goods were cheaper and of better quality than French goods. This would lead to competition driving the price of European goods down to the benefit of the First Nations, but that would be in the future. Monopolizing trade would not be the only problem the French would have to deal with. Much larger problems loomed on the horizon! NEXT WEEK: Trouble in Paridise…1706. Hi everyone! Another week gone by with some major things happening in the world. A major earthquake in Haiti which is a catastrophe the likes of which we have not seen. They need so much help and I urge everyone to give to a registered charity. Also a big election in Massachusetts yesterday that’s going to bring big changes in U.S. politics. Now to get back to the story of the founding of Detroit not only was Cadillac having trouble with the Jesuits discouraging the First Nations from settling around the new Fort Ponchartrain but the various indigenous peoples were reluctant themselves. The Miami and Potawatomi were settled along the St. Joseph River in southwestern Michigan. A group of about 30 Wyandotte families were living near them. Michipichy, called by the French Quarante-Sous, was the head chief of the Wyandotte at the St. Joseph. The governor asked him in Montreal to go back to the St. Joseph and bring his people who were there to de troit, which he did. He also obtained a promise from the Miami that were there that they would also move to de troit after they collected the bones of their dead and set them in order. Cadillac claimed they would all be there if the missionaries had not dissuaded them. They encouraged them to settle at the St. Joseph because they had a small mission already there and they wanted to expand it. He also claimed that the real reason they wanted to do this was to make de troit fail because he had brought a Grey Robe or Recollect priest there. The Augustinian Recollects and Jesuits were competing missionaries. Another strange thing had happened. The governor, de Callieres, had told the head chief of the Miami in Montreal to settle on the St. Joseph after instructing Cadillac invite all the First Nations to settle at de troit. This only served to confuse the Miami as well as the Wyandotte. So Michipichy went to Michillimakinac to see Sastaresty the head chief there. They were under they impression that the governor did not want them to go to Detroit. They decided to sent their elders to Montreal to see the governor to settle the dispute and to do whatever de Callieres wanted. All this confusion made its way back to France even all the way to the King. Louis XIV sent a letter back to the Canadian officials detailing his wishes. His Majesty reported that on the one hand Sieur de la Mothe Cadillac is adamant that de troit will produce all the effects expected of it. On the other hand others have reported that the land there is no good and will not produce the food required to support the population expected there. There is only the poor fishing available and the hunting grounds are 30 to 40 leagues away. There is also the fear of attack by the Iroquois and because the colony lacked the means to defend the newly established fort the result would be that war would recommence. Also, the Company of the Colony were reporting that the cost of establishing this new venture was so exorbitant that it was impossible to sustain. It seems Cadillac had a host of opponents all with their own agendas. So the King ordered through Governor de Callieres and Intendant Beauharnais that Cadillac and the most important of the French settlers at de troit meet and discuss the pros and cons of establishing the new settlement and outline them in a document. Also, all present at the deliberations were to sign the document. His Majesty would then be able to make an informed decision whether to continue augmenting that post, or to leave it as a trading post only or to abandon it altogether. I’ve got some excellent feedback on my posts so I’d like to thank those who have made comments. It gives me encouragement to carry on realizing that people are profiting from my work. There was another great change that took place besides the general peace brought on by the Great Peace Treaty. The French closed their trading post at Michilimackinac and governor Callieres ordered Antoine de Lamothe Cadillac to establish a new one at de troit. The Company of the Colony was formed in 1700 as an association to secure the monopoly of the western fur trade and Cadillac was one of its directors. By the way The Company became insolvent in 1705 and the monopoly was handed over to Cadillac. The French were worried about British trade incursions into the upper country and this new fort was also designed to block them. Cadillac had the idea that if he invited all the nations from the far country to establish themselves around his new post this would not only enhance trade but also firm up military alliances. However, his plan had some wrinkles in it. For one thing it had its detractors. Although the Church’s superiors in Montreal were on board the Jesuit missionaries at Michilimakinac harbored secret resentments. They were jealous of their mission and saw it as a detriment to all their hard work in the upper country. Callieres wrote to the Fathers at Michilimakinac asking them to go with the Ottawa and Wyandotte to de troit and both Fathers Etienne de Carheil and Joseph Marest wrote supporting letters back to their superiors but Cadillac accused them of working against the project by dividing their First Nation charges with lies about the new post and by uttering threats if they moved there. Cadillac was right. At a council held at Fort Ponchartrain on October 3, 1701 the First Nations betrayed the Jesuits real intentions. Ontonagan spoke for all the Ottawa. He was a major chief and was also known as Jean Le Blanc. He informed Cadillac that the missionaries had shown them a letter from him supposedly sent by three Iroquois that he had met on Lake St. Clair. Cadillac was supposed to have said in this letter that the Ottawa should not go to de troit because the Iroquois there will betray them and they would all become dead men. Cadillac denied he wrote any such letter. He told Ontonagan that although the Black Robes and the Grey Robes (the Jesuits and Recollects) were the rulers of religion and never lied about such matters as for other matters he could not speak for them. Koussildouer, the oldest Ottawa chief relayed a message to Cadillac from Ouilemek, chief of the Potawatomi. He informed him that next spring Ouilemek would take the Potawatomi to live near the Miami on the St. Joseph River. He would then come to trade at the new post and if the prices were good he would come often, otherwise he would trade with the British at Albany. Cadillac’s response to this was that Ouilemek was welcome at Fort Ponchartrain but if he wished to trade elsewhere he could do as he saw fit and it would not bother Cadillac. The Wyandotte spoke at the council next. Alleyooue and Quarante-Sous agreed with what Ontonagan had said. He said that although Father de Carheil had told the Wyandotte the same things they did not believe him because Ontonio or the Governor had told them in Montreal to go and encamp near Fort Ponchartrain. Father de Carheil had invited them to go and encamp near the Miami but to return to Michilimakinac the following year. Alleyooue said that they had granted him what he asked but only to get rid of him. Their real desire was to move to de troit near the new fort. Alleyooue also said that Father de Carheil told them at their last council with him that Cadillac was not establishing a new post at de troit but was only going there to trade after which he would return to Montreal. The Wyandotte informed Father de Carheil that they would tell Cadillac all that was said in their councils with him and he forbade them to do so. Not only did they disobey the missionary but asked Cadillac for land near the new post where they could establish themselves. Cadillac commended them and suggested that Father de Carheil was probably just mistaken in his belief that he was only going to de troit to trade. He pointed out the new fort already built and lands cleared that it would be a permanent post. He then promised them land to settle on as soon as they arrived. On the other hand the Ojibwa preferred to keep themselves at arm’s length from the French. Although they needed the trade for European goods they liked to keep their distance. This attitude dovetailed with Young Gull’s wish to move to St. Clair country. He had fallen in love with the place when he stayed at Fort St. Joseph in 1686. So he led a large group of Saulteux Ojibwa south from the St. Mary’s River district and established villages on the Black River and Swan Creek in present-day Michigan. The Mississauga expanded in the eastern part of Southern Ontario taking up residence between the Grand and Gananoque Rivers. They established themselves on the Grand, at the mouth of the Credit River, at Lake Scugog and Rice Lake. However, they did set up a village just north of the new post at de troit. The Amikouai Ojibwa expanded across Georgian Bay to its south shore with villages at present-day Cold Water, Owen Sound and at the mouth of the Saugeen River. 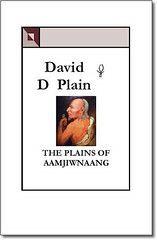 You are currently browsing the Books by David D Plain Blog blog archives for January, 2010.